Olaparib is a first-in-class potent oral poly(ADP-ribose) polymerase inhibitor. The aims of this analysis were to establish an integrated population pharmacokinetic (PK) model of olaparib in patients with solid tumors and to bridge the PK of olaparib between capsule and tablet formulations. The population PK model was developed using plasma concentration data from 659 patients in 11 phase I, II, and III studies of olaparib tablets/capsules monotherapy. 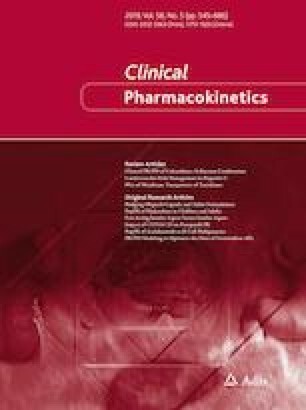 Relative bioavailability between the tablet and capsule formulations was estimated and the relative exposure between olaparib tablet and capsule therapeutic doses was further assessed. The concentration–time profile was described using a two-compartment model with sequential zero- and first-order absorption and first-order elimination for both capsules and tablets with different absorption parameters. Multiple-dose clearance compared with single-dose clearance was reduced by approximately 15% (auto-inhibition). Disease severity had an impact on olaparib clearance, and tablet strength had an impact on Ka. The olaparib geometric mean area under the curve (AUC) and maximal concentration (Cmax) following a single 300 mg tablet were 42.1 μg h/mL and 5.8 μg/mL, respectively, and the steady-state geometric mean AUC and Cmax following a 300 mg tablet twice daily were 49.0 μg h/mL and 7.7 μg/mL, respectively. The relative exposure (AUC) of the 300 mg tablet formulation is 13% higher than the 400 mg capsule formulation. This analysis bridged the olaparib capsule and tablet formulation PK and provided key assessment to support the approval of the olaparib tablet formulation in patients with ovarian cancer, regardless of their BRCA mutation status. The online version of this article ( https://doi.org/10.1007/s40262-018-0714-x) contains supplementary material, which is available to authorized users. The authors would like to thank the patients, their families, and all investigators and study personnel involved. They would also like to acknowledge the programmers who supported the compilation of the dataset, Mihai Surducan of Mudskipper Ltd for medical writing assistance funded by AstraZeneca, and the FDA pharmacometric reviewers Chao Liu, Jingyu Yu, and Yaning Wang for their comments. This study was sponsored by AstraZeneca. Diansong Zhou, Maria Learoyd, Alienor Berges, Tsveta Milenkova, Nidal Al-Huniti, Helen Tomkinson, and Hongmei Xu are employees of and shareholders in AstraZeneca. Jianguo Li and Khanh Bui are former employees of AstraZeneca. FDA. Lynparza prescribing information. 2018. https://www.accessdata.fda.gov/drugsatfda_docs/label/2018/208558s001lbl.pdf. Accessed 11 June 2018. European Medicines Agency. Lynparza (olaparib); EPAR. 2015. http://www.ema.europa.eu/ema/index.jsp?curl=/pages/medicines/human/medicines/003726/human_med_001831.jsp. Accessed 11 June 2018.